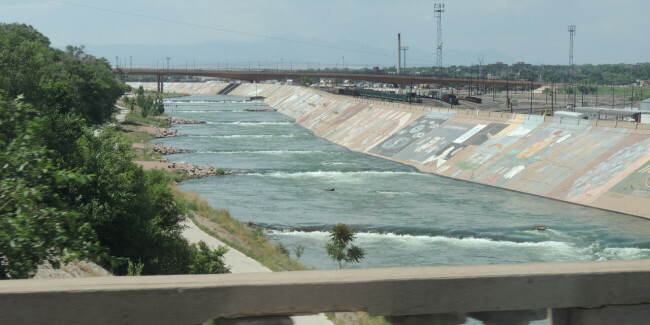 In May 2005, Pueblo Whitewater Park — a half-mile section of the Arkansas between the Fourth Street and Union Avenue bridges — was unveiled. The park featured eight drops primarily for kayakers. [Bob Walker] also began spreading the word on social media via Facebook and surfers came, traveling from Denver, Crested Butte, Glenwood Springs and other areas around the state to ride Pueblo’s waves. Walker now teams with the Colorado Association of River Surfers to host a surfing contest in conjunction with International Surfing Day observed each June. “In the ocean you spend a lot of time paddling for hours. Catching a wave is challenging and then you usually ride for a few seconds,” he said. The river waves range 2-3 feet in height. The Pueblo course is rated No. 1 in Colorado and among the top 10 across the U.S., Gogarty boasts.